Dr. Alexey Frolov obtained his Specialist Diploma in Computer Science from the Bauman Moscow State Technical University (BMSTU) in 2010, and his Candidate of Sciences degree in Mathematics from the Institute for Information Transmission Problems of the Russian Academy of Sciences (IITP RAS) in 2012. During the following four years, Alexey did research internship at the Ulm University (Germany), Swiss Federal Institute of Technology (EPFL, Switzerland), University of Maryland (USA) and Israel Institute of Technology (Technion, Israel) which resulted in joint publications in leading journals on information and coding theory. 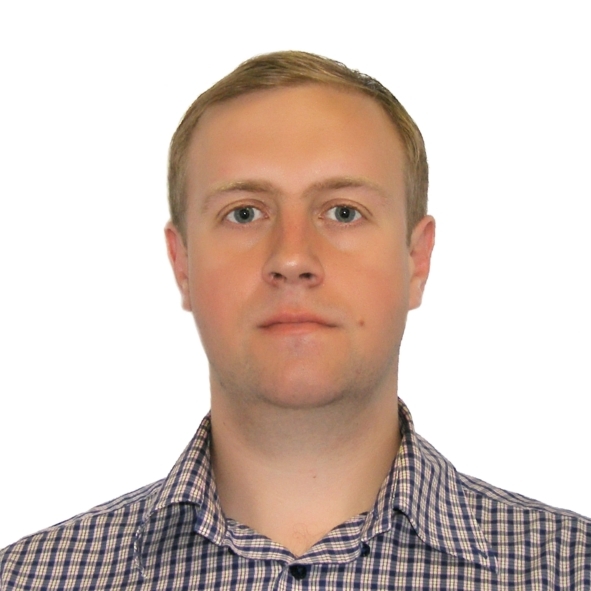 Alexey has been a Senior Researcher at IITP RAS since 2013. In 2015-2016, Alexey was a project leader of a joint project of Huawei and IITP RAS on investigation and development of error-correcting codes for future 5G physical layer. Since 2016 he has been a Senior Research Scientist at Skolkovo Institute of Science and Technology (Skoltech). In 2017, Alexey has been appointed as an Assistant Professor at Skoltech. Since February 2019, he serves as an Associate Professor at Skoltech. Alexey is a recipient of Russian Government Award in Science and Technology for Young Scientists (2016), Moscow Government Award for Young Scientists (2013) and Russian President Scholarship (2013). Coding for fiber optic lines. Post-quantum (code and lattice-based) cryptography. See the Research details and PhD positions. A. Frolov, V. Zyablov, On the multiple threshold decoding of LDPC codes over GF(q) // Advances in Mathematics of Communications, 2017, 11:1, 123-137. I. Tamo, A. Barg and A. Frolov, Bounds on the Parameters of Locally Recoverable Codes // IEEE Transactions on Information Theory, 2016, 62:6, 3070-3083. A. Frolov, “Upper bound on the minimum distance of LDPC codes over GF(q) based on counting the number of syndromes // Problems of Information Transmission, 2016, 52:1, 6–13. A .Frolov and V. Zyablov, On the capacity of a multiple-access vector adder channel // Problems of Information Transmission, 2014, 50:2, 133–143. A. Frolov and V. Zyablov., A Coding Technique for Q-Frequency S-User Gaussian Channel // Journal of Communications Technology and Electronics, 2014, Vol. 59, No. 12, pp. 1483–1488. D. Osipov, A. Frolov and V. Zyablov, On the user capacity for a multiple-access system in a vector disjunctive channel with errors // Problems of Information Transmission, 2013, 49:4, 308–321. D. Osipov, A. Frolov and V. Zyablov, Multiple access system for a vector disjunctive channel // Problems of Information Transmission, 2012, 48:3, 243–249. V. Zyablov and A. Frolov, A signal-code construction for a multiple-access system using a vector channel with an additive white Gaussian noise // Journal of communications technology and electronics, 2012, 57:8, 953-957. A.Frolov and V. Zyablov, Bounds on the minimum code distance for nonbinary codes based on bipartite graphs. // Problems of Information Transmission, 2011, 47:4, 327–341. Зяблов В.В., Рыбин П.С., Фролов А.А., Алгоритм декодирования с вводом стираний для МПП-кодов, построенных над полем GF(q) // Информационно-Управляющие Системы, 2011, 50:1, 62-68. A. Frolov and V. Zyablov, Asymptotic estimation of the fraction of errors correctable by q-ary LDPC codes. // Problems of Information Transmission, 2010, 46:2, 142–159. Kruglik S., Potapova V., Frolov A. A method for constructing parity-check matrices of non-binary quasi-cyclic LDPC codes // The Tenth International Workshop on Coding and Cryptography, Saint-Petersburg, Russia, September 18-22, 2017. Kruglik S., Dudina M., Potapova V., Frolov A. On One Generalization of LRC Codes with Availability // In Proc. IEEE Information Theory Workshop (ITW), Kaohsiung, Taiwan. pp.1-5, November 6-10, 2017. Kruglik S., Frolov A. Bounds and Constructions of Codes with All-Symbol Locality and Availability // // In Proc. IEEE Int. Symp. Inf. Theory, Aachen, Germany, June 25-30, 2017, pp. 1023-1027. Frolov A., Rybin P., Ivanov F. On Iterative LDPC-Based Joint Decoding Scheme for Binary Input Gaussian Multiple Access Channel // 2016 XV International Symposium “Problems of Redundancy in Information and Control Systems” (REDUNDANCY), Saint-Petersburg, Russia. September 26-29, 2016. P. 48-52. Frolov A. and Zyablov V. A new coding method for a multiple-access system with a large number of active users // In Proc. IEEE Information Theory Workshop (ITW), Jerusalem, Israel. pp.1-5, April 26-May 1 2015. Frolov A. and Zyablov V. On the Multiple Threshold Decoding of LDPC codes over GF(q) // In Proc. IEEE Int. Symp. Inf. Theory, Hong Kong, China, June 14-19 2015, pp. 2673-2677. Frolov A., An Upper Bound on the Minimum Distance of LDPC Codes over GF(q) // In Proc. IEEE Int. Symp. Inf. Theory, Hong Kong, China, June 14-19 2015, pp. 2885-2888. Frolov A. and Zyablov V. A Coding Technique for Q-Frequency S-User Gaussian Channel // Труды конференции «Информационные технологии и системы (ИТиС’14)». Нижний Новгород, Россия, 1 – 5 сентября 2014. М.: ИППИ РАН, 2014. С. 455-459. Frolov A. On the Hamming-Like Upper Bound on the Minimum Distance of LDPC Codes// XIV International Workshop on Algebraic and Combinatorial Coding Theory (ACCT 2014) September 7-13, 2014, Kaliningrad, Russia. P. 157-162. Frolov A. Upper Bounds on the Minimum Distance of Quasi-Cyclic LDPC codes // XIV International Workshop on Algebraic and Combinatorial Coding Theory (ACCT 2014) September 7-13, 2014, Kaliningrad, Russia. P. 163-168. Frolov A., Zyablov V., Sidorenko V., Fischer R., On a multiple-access in a vector disjunctive channel. // In Proc. «IEEE International Symposium on Information Theory». Istanbul, Turkey, July 7-12, 2013. P. 211-215. Frolov A., Zyablov V. Upper and Lower Bounds on the Minimum Distance of Expander Codes // Proc. of IEEE International Symposium on Information Theory (ISIT 2011), Saint-Petersburg, Russia. 2011.–Jul./Aug. P. 1302–1306. Osipov D., Frolov A., Zyablov V. A Multiple Access System for Disjunctive Vector Channel // XIII International Workshop on Algebraic and Combinatorial Coding Theory (ACCT 2012) June 15 – 21, 2012, Pomorie, Bulgaria. P. 269-274. Frolov A., Zyablov V. Insertion of Erasures as a Method of Q-ry LDPC Codes Decoding // Proc. of XII International Workshop on Algebraic and Combinatorial Coding Theory (ACCT 2010), Akademgorodok, Novosibirsk, Russia. 2010.– Sept. P. 138–143. Frolov A., Zyablov V. The Application of Q-ary LDPC-codes for Fiber Optic Lines // Proc. of XII International Symposium on Problems of Redundancy in Information and Control Systems, Saint-Petersburg, Russia. 2009.–May. P. 121–125. Thesis: Error-correcting capabilities of non-binary LDPC codes. Thesis: Development of decoding algorithms for non-binary LDPC codes.